ADM Residential is a leading Estate Agency in Huddersfield providing a comprehensive range of services to our customers within the Huddersfield and surrounding areas. Please see below for information on our services we provide: We pride ourselves on assisting our clients with a professional touch and thrive on 'going the extra mile'! We offer comprehensive selling fees with all on line marketing including Rightmove, Zoopla, and adverts in the one off fee. We have local properties on the market to suit the needs of our customers. 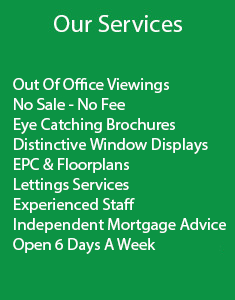 We offer a full range of services and products to our landlords and tenants. This can range from simply finding a tenant to full property management, allowing the client to choose, with our guidance, the most appropriate service for their situation. Every week we carry out numerous property valuations on homes across the Huddersfield and West Yorkshire area that vendors are looking to place on the market. We have access to New Homes from time to time by private builder and can assist in all stages of the development process. From land introduction and specification to the build to effective selling and buy off plan. Conveyancing is where transfer of legal ownership of property from one person to another. We provide a free quotes for the conveyancing by Ramsdens, Butterworths, CM Law and Gaddes & Nobles Solicitors. Our team at ADM operate really is a closely with the solicitors to keep you up to speed with the progress of selling your home.